Although I strongly advocate hunting close to home in my book Backyard Deer Hunting: Converting deer to dinner for pennies per pound as one a way to put low-cost wild-game meat in the freezer, travel has always been an interest of mine. I may go on trips in the U.S. and elsewhere using any available mode. Very commonly I do this by myself and this often requires long distance driving that may take several days. The amount of gear that I take often controls if I go using my truck or fly. Some hunts, such as waterfowling may require thousands of individual items if you are going to do it by yourself and must provide boat, decoys, clothes, dog stuff, gun-related items, food, cooking and camping gear, etc. This requirement is considerably reduced if you are working through a guide who has this material on site. My particular case is complicated because I mostly use black-powder guns and each requires its own set of components and support equipment. I cannot fly with black powder or percussion caps, so this further restricts travel options. 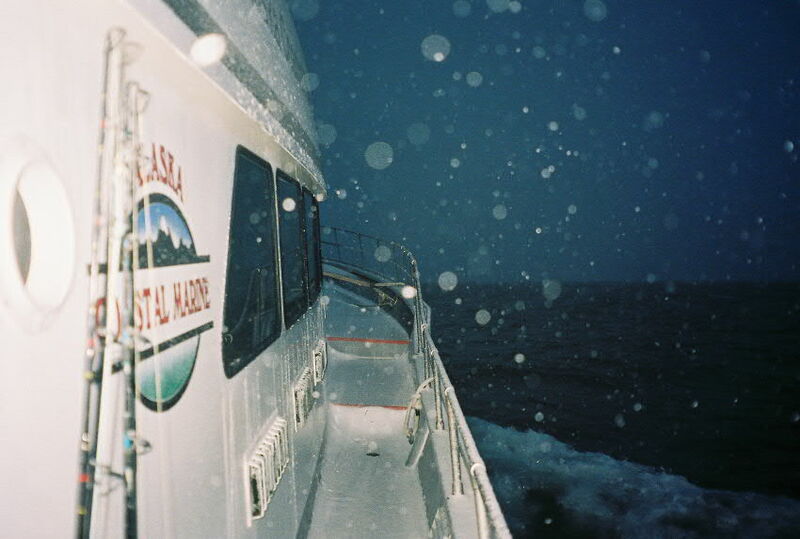 The MV Spirit on a Nov. hunt off Kodiak Island. On a radio show to be aired starting March 22 on WebTalkRadio.net, I discuss some North American hunts where I used my truck, Bondo Boat and Weldo Trailer to make a cross-country bowfishing trip. This is followed by a plane trip to Canada for a crossbow hunt for black bear, a boat hunt for blacktail deer on Kodiak Island and a train trip into Mexico for a duck hunt. All of this is in contrast to my usual hunting where I grab a gun and walk out from my house. To go directly to the show page click on the following URL : This show is now available. If it is not the current show it may be found under the “Archived Shows” tab at the top of the page. Listen now at: http://webtalkradio.net/shows/hoveys-outdoor-adventures/. Look forward to listening to your show today.